Lurking the background of many previous articles here at Per Square Mile is a recently formulated framework that describes everything from the heart rate of a mouse to the aorta size in a blue whale. It’s called the metabolic theory. Metabolic theory’s origins span two states and six decades. Max Kleiber originally formulated the basic relationship between body mass and metabolism back in the 1930s. 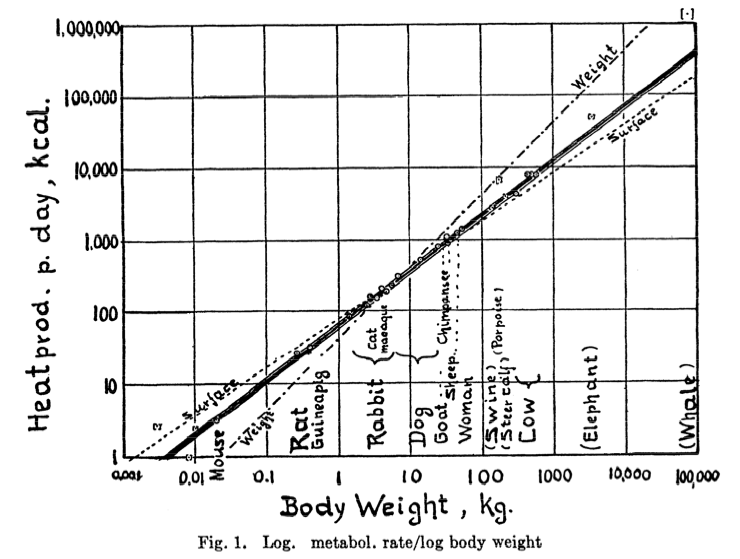 Kleiber, a professor at the University of California, Davis, produced a famous plot (see below), where body mass is related to metabolism over nine orders of magnitude, from mice to elephants. His analysis of a subset of that data revealed a trend by which metabolism scaled with body mass raised to the ¾ power. He proposed an underlying theory which he felt could explain the results, but it didn’t stick. Decades later, Geoffrey West, a theoretical physicist at the Santa Fe Institute in New Mexico, was ruminating on matters of life and death. Specifically, he wondered why he could live to be 100 years old but a mouse would only live a few years, despite vast similarities between himself and a mouse on a cellular scale. In the course contemplating this, West had become interested in the work of Max Kleiber. Meanwhile, an hour north on Interstate 25, ecologists Jim Brown and Brian Enquist had recently combed through the literature and discovered that Kleiber’s law also applied to plants, but they were struggling with an explanation as to why. Fortunately, West was soon introduced to Brown and Enquist, and the trio embarked on a collaboration that would revolutionize the way scientists think about ecology. Metabolic theory was one of the main scientific contributions of that partnership. Put simply, it states that a whole host of ecological phenomena are governed by metabolism, which itself is limited by the rate at which its chemical reactions can acquire the necessary compounds. And those reactions are limited by the distribution network which supplies chemical compounds, whether that be an animal’s circulatory system or a plant’s vascular system. 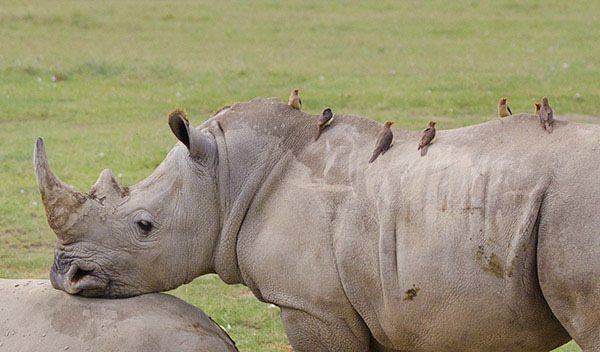 Important to this relationship is that the final branch of the network is the same size across species within a group. And they are—capillaries, for example, are the same diameter in everything from mice to elephants. As these distribution networks branch from large to small—aortas to capillaries, trunks to leaves—they follow a fractal pattern, which provides the mathematical basis for the ¾ power in Kleiber’s law. Klieber’s law turned out to be just one of many such relationships, all of which scaled according to power laws with exponents in increments of ¼. I can imagine West, Brown, and Enquist started feeling about ¼ exponent power laws the same way you and I do when we buy a new car or computer—we start seeing them everywhere. The researchers had stumbled upon what appeared to be a fundamental law of biology which exerted its influence in seemingly disparate systems. Mortality scales to the -¼ exponent of body mass, meaning smaller animals live shorter lives than larger ones. Plant resource use scales to the ¾ power of mass. Plant population density scales with biomass to the -¾ power, a refinement of earlier self-thinning laws that reported a -⅔ exponent relationship. Total standing biomass scales with individual body size raised to the ¼ power. And on and on and on. The metabolic theory of ecology hasn’t been without it’s detractors, but no good theory should go untested. Still, no matter the outcome of those challenges it has done ecology a world of good, pushing the field to think beyond it’s descriptive roots.